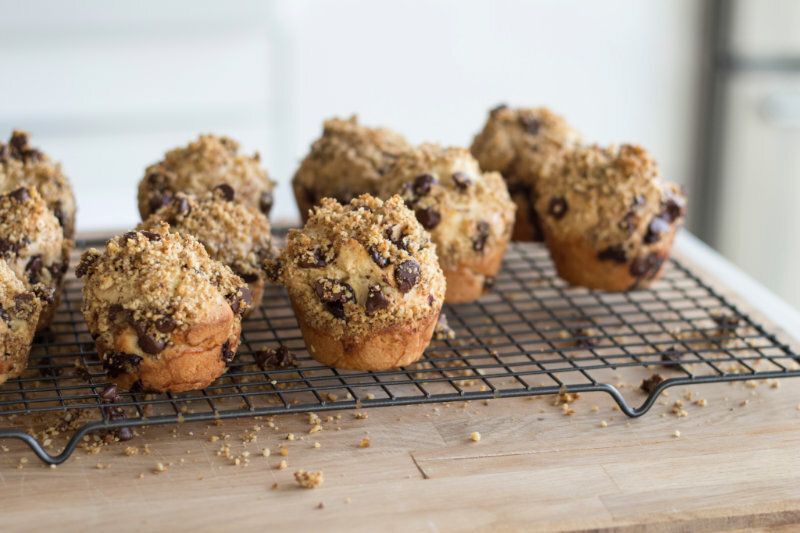 There’s nothing like a basket of warm chocolate chip muffins in the morning, fresh out of the oven. The chocolate chips are slightly gooey from their time spent in the oven and an absolute delight on the palate. We love making this chocolate chip muffins recipe with Greek yogurt because of the superior texture it provides the muffins. Not only are these muffins a healthier alternative to classic chocolate chip muffins, but the yogurt makes these muffins incredibly moist and tender. If you wanted to make this chocolate muffins recipe egg-free, you could easily swap in a ripe, mashed banana instead of the egg outlined below. The result would be a banana muffin recipe that is just as satisfying. These healthy muffins can be made ahead of time and stored in the freezer to be later defrosted and quickly warmed up in the microwave, or they can be stored in an airtight container in the fridge for a few days. We honestly prefer them straight out of the oven and don’t think they’ll last long enough to be saved for later anyways! Preheat the oven to 350°F. Grease 9 molds in a standard muffin tin and dust each with flour. Do not use paper liners as these muffins will stick. To a medium bowl, add the cup of flour, then remove one tablespoon of flour from the bowl and put it back in the flour container. To the flour in the bowl, add the cornstarch, baking powder, salt, and mini chocolate chips. Stir everything to combine well. To a large bowl, add the egg, Greek yogurt, brown sugar, and melted (and cooled) coconut oil. Stir everything to combine. Add the dry ingredients to the wet ingredients, using a rubber spatula to gently stir everything together just until it's all combined. Do not over-stir as this will result in dense muffins. Distribute the batter among the 9 prepared molds, then fill water in the remaining unfilled molds for even baking. Feel free to sprinkle a little bit of brown sugar or extra chocolate chips on the tops. Bake the muffins for 18 to 22 minutes, just until the edges begin to golden and a toothpick inserted in the center comes out relatively clean or with just a few crumbs. Cool in the pan for a few minutes before removing the muffins from the tin and cooling on a wire rack.